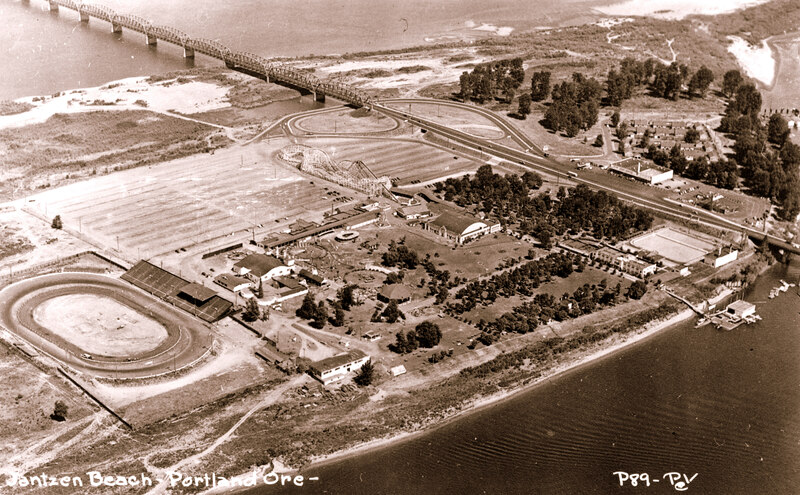 The Jantzen Beach Amusement Park opened on May 26, 1928 and was the largest amusement park in the country spanning 123 acres of land, heralded as “Portland’s Million dollar Playground”. Built in 1928 by legendary Coaster Designer Carl Phare, the Big Dipper Roller Coaster at Jantzen Beach was one of its star attractions, the biggest and baddest coaster in the West. The Dipper cost $75,000 to build in 1928, and had a 3,000-foot-long track with reverse curves, 60-degree banks, and one virtual somersault. The Big Dipper was 55 feet tall at its highest point, and was said to send cars screaming downhill at close to 100 miles an hour. 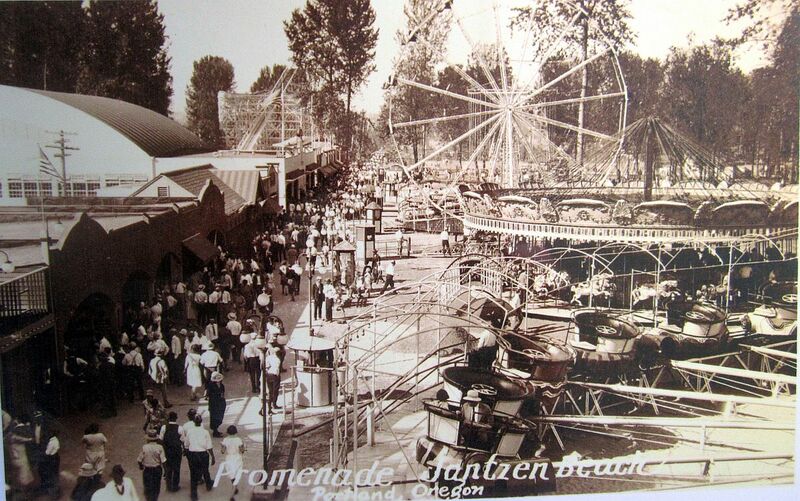 The Jantzen Beach Amusement Park had many attractions to offer besides the coaster. The park, in the 1950 photo (above) also featured a Kiddie Dipper steel coaster, four swimming pools, a natatorium (a building containing a swimming pool), Golden Canopy Ballroom, picnic grounds, Fun House, Venetian Canal ride, Ferris Wheel, Elbow Room Restaurant, Jantzen Beach Railway, Two robot circus criers, “Laffing Sal” and “Joe Barker”, and the 1921 C.W. Parker Carousel. In 1958, a second highway lane across the I-5 bridge took out a large portion of the park, which was already suffering from a loss of attendees. On Labor Day, 1970, the park shut down for good. Oaks Park’s new Adrenaline Peak roller coaster starts with a 72-foot vertical climb and then a past-vertical, 97-degree fall. It has a bigger loop than the previous coaster (70 feet, as opposed to 40 feet), a partial inversion and a full corkscrew. The ride takes less than one minute. New technology and the new Vancouver Waterfront open up new possibilities for Jantzen Beach. The new Raptor coaster track lets riders sit single-file, astride a single, 15-inch-wide steel rail…instead of riding atop a pair of rickety tracks. It’s clean, compact architecture. Doesn’t block the view of the river. The coaster could be located just West of the bridge. It could be joined by a Columbian Mammoth, artificially buried in a swimming pool-like pit, like a scene from 2001. Later, a real Columbian Mammoth would be brought to life by CRISPR. Above the Mammoth pit is the “museum” with a VR room and dioramas of the last ice age. Kennewick Man would be (virtually) on display. Everything else in VR – snowboarding, windsurfing, fishing, jet skiing, hydroplane racing, F-15 dog fights, zip lines, or even VR roller coasters. Buy a bracelet for $30. The true purpose of the “pocket” amusement park on Hayden Island might be to subsidize an on-line presence dedicated to science, deep-sea exploration, and the Cascadia Subduction Zone. A partnership with OSU would bring the Ocean Observatories Initiative home. Portland houses one of the primary cyberinfrastructure centers, and the cloud-based, science-oriented program would dramatize to the public the impact that oceans and tectonic forces have on our future. The OOI is the Cabled Array off the coast of Oregon. Its sensors, spanning the Juan de Fuca plate and an active underwater volcano, are connected by 900km of fibre-optic cable, powered by electricity cables that run out from the shore. In all, more than 830 instruments make physical, chemical, and biological measurements from above the water’s surface down thousands of feet to the ocean floor, operating around the clock, 365 days a year. These data are served up free-of-charge via the OOI data portal, many in near-real time. The Cascadia Subduction Zone is the Really Big One.